TraceNoizer is a web-based search, analysis and homepage publication system available for use in the Open_Source_Art_Hack exhibition created by LAN--Annina R�st, Roman Abt, Fabian Thommen, Urs Hodel, and Silvan Zurbruegg. TraceNoizer is a web-based search, analysis and homepage publication system. It is made available for public use on a computer pod. TraceNoizer is a project that grew out of the artists� interest in the way in which, when researching an individual person on the Internet, search engines construct someone�s identity, or "databody" from information that may be real or false, old or new, relevant or irrelevant, or about a completely different, but similarly named person. TraceNoizer finds data on the Internet that is connected to a particular name, nickname and/or email address and continuously merges that data into a potentially infinite number of minimally differing "clones" in the form of homepages that are automatically uploaded on servers and made available to surfers and search-engine indexing-robots. The first search and analysis that TraceNoizer performs on a name yields a certain number of keywords. For each keyword or "theme" an HTML-site is automatically generated and linked to all the other theme pages that contain text and images. The TraceNoizer system then periodically starts new queries�-successively using the themes of the most recent search as new search terms�to generate new �clone� pages. As more clones are generated, the less resemblance they have to the original databody, but Tracenoizer submits the url of each to search engines, initiating the constant processing and reprocessing of the clones. 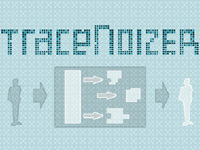 At transmediale.02 in Berlin, TraceNoizer was jointly awarded the prestigious first prize for the "Software" category. This is the first time LAN�s work is presented in the United States. LAN is a label of the Department of New Media (www.snm-hgkz.ch) at the University of Art and Design Z�rich, Switzerland. Students, designers, artists and media workers operate under this name, bringing together a range of visualization, design, communication and analytical skills. The members of LAN have lived and worked in Z�rich since 2001. LAN creates network-oriented interactive projects. They locate and critically discuss economic, political, cultural and creative "issue-clusters" that are essential for communication processes in digital networks. LAN views their open source/open content position as a small but effective stance against the cultural dominance of large IT corporations�-developing applications and tools with free software modules and scripts, and publicizing their products for use by others. Additional support for LAN from the Consulate General of Switzerland and Zurich University of Art and Design www.hgkz.net. I need to get a comment in here, so I can see how the template for comments is implemented within the overal page structure.